Children started the feeding skills by sucking their fingers in the womb. It continues to develop until they are able to enjoy eating adult’s food. 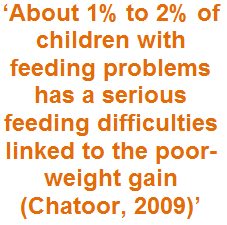 However, about 25% of normal children are facing feeding problem (Chatoor, 2009). It is also estimated that 80% of children with developmental problem have been reported to have this problems (Chatoor, 2009). Feeding problem usually manifested as the child refused to eat. Did not want to try foods with more texture. Unable to control gagging or vomiting as their reaction to foods. 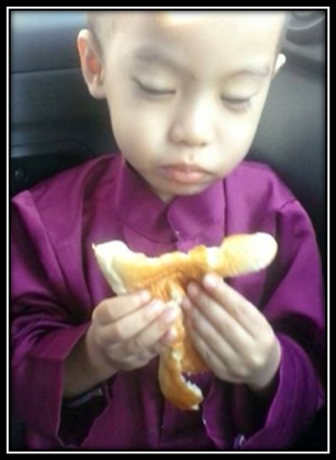 Delayed developmental skills and medical status are also factors that can cause feeding problem. The clinician must identify the exact root cause carefully as usually the presentation is almost same. Hence, the treatment strategies are differing to one another cause. *Strategies discussed here can be varied base on the needs of a child. Please take note that these may not appropriate for all children with behavioral feeding problem. 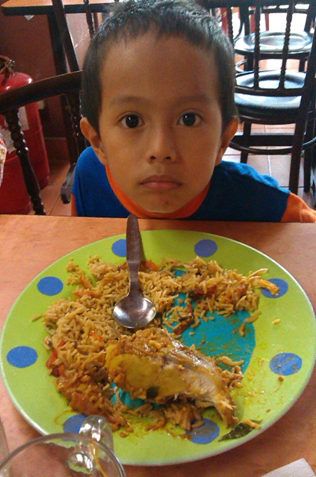 Parents should show a good example when eating or during meal time. Parents can introduce a rule during mealtime that implies on all family members. Example; Nobody is allowed to sit in front of the television during mealtime as they must sit together at the dining table. Setting a common rule for all will allow the child to observe parents and siblings behavior and reaction towards mealtime. Child will remember it and soon will be able to regulate with it. Break Each Goal Into Small StepsA child will perform better if they can easily achieve the target goal/step. Break the goals into a small step and tolerable to the child. Thus, higher chances can be achieved towards the end of the goal. Reward Each StepPraise and reward the child after completing/achieving each step. Give a reward by praising the child or by giving a highly appreciated reinforcement to motivate the child to continue the good feeding behavior. Praise and reward the child after completing/achieving each step.Some children may need repetitions to follow the steps. It can take over series of meals, or days or weeks before they are able to complete the small step without difficulty. Start From Zero A child needs to complete the specific small step/ task to earn their favorites. This technique is better to be applied with older children. Some children may become very resistant to tolerate small steps/changes. This change will lead to undesirable behaviors. It is even worse when the change increases his undesirable behaviors. Some of the children may initially cooperate with new plan and then backtrack or become resistant. Parents should seek professional helps to determine what kind of feeding problem the child has and what strategies are likely to be more effective. Usually an interdisciplinary feeding team consists of professionals that involve in managing feeding problem can provide a comprehensive feeding plan for the child. Therefore, if parents have any issue regarding their children’s feeding situation, do consult these experts. The child should be evaluated by a trained clinician as early as possible to maintain the child’s good health. Hyperactive: Is It Bad Parenting?